Long version: Dexter, a serial killer of serial killers, works in the Miami Metro Police as a blood spatter analyst alongside with his foster sister Deb. We learn that Dexter was taken from a violent crime scene and raised by a cop. Upon learning that Dexter was prone to murderous intentions, his dad taught him the art of killing. Suddenly, a new wave of killings crop up and are accredited to the “Ice Truck Killer” and Dexter recognizes that these killings are somehow a message to himself. Using his skills as a killer and resources at the police department, Dexter helps track down the killer while trying to keep those that matter to him safe. Unfortunately, I have to say this is exactly what I expected. I watched two seasons of Dexter before picking up one of the novels (much to my shame), partly due to the horrible things I had heard about the books. Unsurprisingly, the writing was entirely mediocre, unsophisticated, and wholly disappointing. Naturally, I couldn’t help but compare Darkly Dreaming Dexter to the TV series. 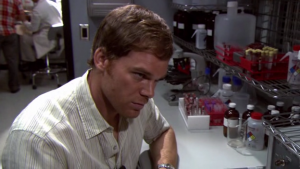 The novel is told from Dexter’s point of view, and really does try hard to achieve the same dark, cynical, wry atmosphere that the TV adaptation manages to accomplish so well… but just falls short. The pacing of the book was alright, as in there was always some action each chapter to propel the story forward. I feel like I’m really at a loss for what else to say about the novel. It was just unremarkable (again, comparison to the TV series). There are some minor plot differences between the novel and show, except for the ending; however, I don’t really care because I’m not reading anymore books. At the least, reading Darkly Dreaming Dexter has made me appreciate the TV adaptation immensely. You really begin to gain an understanding of the skill involved in developing Dexter’s character for the screen, piecing together the soundtrack and film style for that perfect cynical criminal atmosphere, and the screenplay is just impeccable. The TV show has really come a long way from the novel and certainly shaped a masterpiece from raw materials. Seriously, this is one of the only novels whose screen adaptation far surpasses it in quality. I feel like this is what will happen if we read any of the Southern Vampire Mysteries. I’ve heard those are very entertaining and pretty well written, though. But then, I haven’t seen True Blood yet (I know, I know), so I don’t have any expectations against which to compare.